2 of 9 Beat butter and sugar in large bowl with mixer until light and fluffy. 3 of 9 Beat in egg, egg yolk, lemon rind and vanilla. Stir in nuts. 4 of 9 Mix flour, baking powder and cinnamon on waxed paper. Stir into egg mixture, blending well to make a stiff dough; use hands if necessary to mix the ingredients together. Wrap in waxed paper and chill several hours or overnight. 5 of 9 Divide dough into quarters. Work with one-quarter at a time and refrigerate the rest. Roll quarter between sheets of waxed paper to about 1/4-inch thickness. With 2-inch round cookie cutter, cut as many circles from dough as possible. Carefully remove circles from waxed paper and place on ungreased baking sheet. Repeat process with remaining 3 quarters. Refrigerate scraps for second rolling. 6 of 9 With a 3/4-inch round cookie cutter, cut out and remove center of half the circles on baking sheets. Reroll the scraps. 7 of 9 Bake in 350 degree F oven for 8 to 9 minutes or until edges are golden. Remove from oven and cool cookies on baking sheet for about 5 minutes. Carefully remove cookies with metal spatula to wire racks to cool completely. 8 of 9 Heat jam in small saucepan. 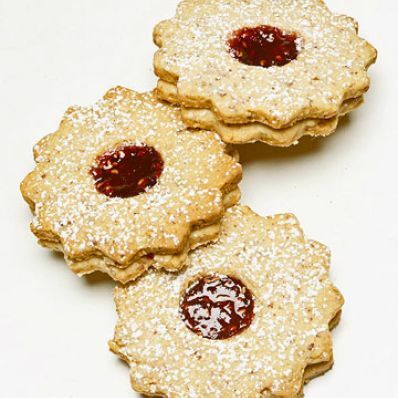 Spread each of the solid cookies with thin layer of jam. Top each with a cut-out cookie and gently press together to form sandwich. 9 of 9 Place cookies on wire rack placed over waxed paper. Dust with confectioners sugar. Spoon a small amount of jam in opening of each cookie. Allow to set. Makes about 4 dozen cookies. Per Serving: 24 mg chol., 9 g Fat, total, 4 g sat. fat, 1 g fiber, 13 mg sodium, 2 g pro., 153 kcal cal., 17 g carb.